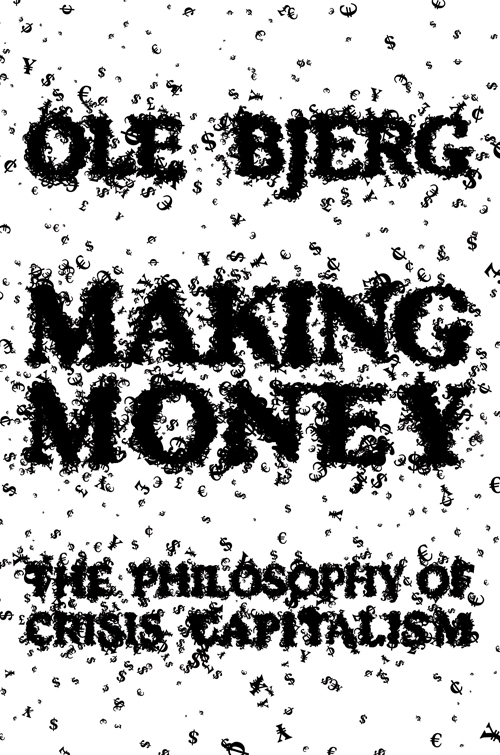 With Making Money, Ole Bjerg presents a philosophical — and psychoanalytic — analysis of contemporary economics and finance. He draws explicitly from the theories of Slavoj Žižek. What he delivers is one of the most coherent offerings yet on the nature of contemporary economics. The first parts of the book map out the basic philosophical/psychoanalytic concepts being applied, and briefly traces their roots. Primarily, these involve assessments of the “orders” of the Real, the Symbolic, and the Imaginary. These are concepts that Žižek imported directly from French psychiatrist/philosopher Jacques Lacan. From that foundation, the theories are applied to explain the origins and conception of money itself. This is among the most enlightening parts of the book. Many others have explored this topic (notably, David Graeber‘s Debt: The First 5,000 Years (2010), among others). But this telling is rather concise, with much of the space in the book devoted to a theory of money that is scrupulously consistent, rather than being just a patchwork of isolated, if compelling, commentaries that stop short of articulating a unifying theory. Then, in the final parts of the book, Bjerg tackles the elements of the recent crisis in the financial/banking sector, and concludes, briefly, with essentially a single policy recommendation. Overall, he’s written one of the most compelling and cohesive accounts of modern economics and finance. Although, no doubt, his reliance on the continental philosophy of Žižek for his analysis will rekindle all the usual disputes about the utility of continental philosophy. The title of the book derives from the observation that banks are quite literally given the nearly unique privilege (aside from increasingly impotent governments) of “making money” from thin air. In order to clear accounts between clients, and between themselves, banks use “fractional reserve” policies to loan out far more “credit money” than they possess (reserves) in terms of government-issued cash, gold, or the like. This is sort of the basis for Bertold Brecht‘s quip from The Threepenny Opera, “What is the robbing of a bank compared to the founding of a bank?” Bank (credit) money now dwarfs government (fiat) money. But in that empirical shift toward credit money, Bjerg also detects a philosophical shift. Credit money fuels derivatives trading — the practice of banks and financial institutions making bets (default swaps, futures, etc.) derived from the “risk” associated with other financial activities (price movements on bonds or stocks, etc.). The key narrative is an explanation of how money serves a symbolic function, and the modern world permits banks to create “credit money” independent of governments and ordinary citizens. This narrative allows Bjerg to offer some quite substantial commentary on one of the most fundamental (and fundamentally unresolved) questions of economics: what is “value” and how is it determined? Applying Žižek, Bjerg concludes that there is economic “value” that is a hard kernel of an unknowable truth (the Real), represented only by purely symbolic representations of “price”. In the contemporary age, the imaginary “fantasy” in finance and economics is of “being in the market”, which posits that the mere ability to offer (symbolic) prices in the a market is the desire (ideology – in the imaginary order) that drives the economy. In neoclassical economics, statistics (math) and the “efficient market hypothesis” are the dominant ways that “being in the market” is expressed. “The knowledge that the model does not conform to the nature of actual reality is not incorporated into the model itself. It remains an unknown known.” (p. 229). “the unknown known of financial markets [is] the notion that prices in financial markets behave in a way that makes them subject to probabilistic reasoning. This form of reasoning in finance presupposes the distinction between known unknowns (the direction of future price movements) and known knowns (the historic price volatility of an asset). The unknown known is the very distinction between these two categories of knowledge.” (p. 228). This offers a strikingly clear explanation for how neoclassical economics can create complex mathematical formulas to model economic activity that fundamentally break down due to a lack of connection between their variables and the real world — an effort to act as if the symbolic is the real, in Žižek’s/Lacan’s terms. The denial of the ideology that desires “being in the market” facilitates and reinforces financialization of the economy. There is a kind of dual causality in modern finance and economics that places money further away from “real value”. Symbolic constructs (financial derivatives) are piled on top of symbolic constructs (prices, risks), with the “belief in being in the market” seen as the endgame. This sort of thinking ties the two symbolic constructs together such that each legitimates the other, while marginalizing the role of “real value” (production, etc.). The inherent limits of “real” production imposed by scarce labor and raw material resources is sidestepped to allow theoretically unlimited “credit money” creation. This sort of thinking also basically sidesteps the notion of conscious political objectives beyond the mere creation and maintenance of “a market”. A few examples in the book highlight this. Right after the 2007-08 financial crash, Ben Bernanke claimed that “we won’t have an economy on Monday” without a government bailout of the financial sector, which reveals a mode of thinking that only recognizes a desire for financial markets to exist (“being in the market”) and no discernible desire for other political ends, such as equality, public health and welfare, etc. Rather than an explicit discussion of the desires that political processes should pursue, the desire for “being in the market” is disavowed — assumed away. The analysis in Making Money is meant to be a purely philosophical proof. This is the book’s single greatest strength. If you come to it looking for a catalog of citations to other writers, particularly economic ones, who have reached the same (or different) conclusions, then you are looking in the wrong place. There have been, indeed, quite many economists who have reached essentially all the same conclusions as Bjerg (Veblen, Hudson, Keen, Hossein-zadeh, Nasser, etc., etc.). But many critical economists, all “heterodox” ones who work almost entirely outside the realm of mainstream recognition, sometimes have an unfortunate tendency to write griping tracts that wallow in a sort of “sour grapes” mentality. They bemoan that how no matter how correct they are, no matter how logically superior their arguments, no matter how many facts support them and contradict competing theory…no one listens — going so far as to even suggest that mainstream economists get where they are precisely because they are wrong. Bjerg cuts through all of that. He provides, in a sense, an independent proof. He is able to step partially outside the fray, and describe the key aspects that bound the fray, because he resorts to psychoanalytic techniques. Making Money places continental philosophy and psychoanalysis alongside anthropology (Graeber), sociology (Bourdieu), physical science (Soddy), and maybe a few other academic disciplines lining up against neoclassical economics, which is looking increasingly isolated from all other academic disciplines and rather nakedly aligned with the finance/banking sector and their political parties in a strictly partisan way. That recommendation Bjerg makes at the end of the book? Well, Bjerg arrives at the same conclusion that Nobel prize winning chemist Frederick Soddy arrived at almost a century ago: elimination of fractional reserve banking. This sole policy proposal is about denying banks the ability to create “credit money”. However, Soddy is not mentioned here — nor, for that matter, is Marx and Engels‘ demand in The Communist Manifesto: “5. Centralisation of credit in the hands of the state, by means of a national bank with State capital and an exclusive monopoly.” Instead, Bjerg cites Irving Fisher‘s “100 percent reserve” proposal, and latter-day economists who endorse Fisher’s proposal (which was adopted from Soddy). Whatever Bjerg’s reasons for citing the people he cites, this has the implicit effect of downplaying Soddy’s reputation as a “crank” and accentuates Fisher’s status as a respected pillar of conservative economics, thereby allowing Bjerg to proffer a grand compromise between politics of the left and right to reform finance. More than likely, Bjerg will be ignored just as much as Soddy, Veblen, and all the others. That is too bad, because at a conceptual level this book is far more compelling than anything dealing with economics that touches the bestseller lists. But there is something else useful about Bjerg’s critique. His appeal is at the level of psychology. He is not directly politically attacking the captains of finance as being “bad actors”, though the result of his proposal would be to completely remove the greatest windfall privilege of the banking and finance sector and thereby decimate the finance sector as it really exists today. Rather, he is trying to reveal what the banking sector desires through their economic theories. At this level, anyone can ask: is that what I desire too? It is hard to change desires. But psychoanalysis posits that it is possible. Bjerg is suggesting that it is better to work to desire something (anything) in the “real economy” of production than to merely desire “being in the market”. The elimination of fractional reserve banking would be the most direct policy approach in making such a change. It would allow the question of how money is created to be politicized, that is, put forward as a topic for explicit political debate.